Are some of my citizens really replicants in Cities: Skylines? 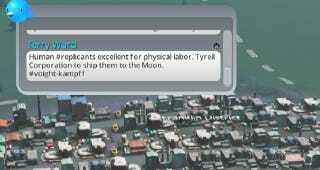 If you play Cities: Skylines you probably try to ignore the Chirper messages. (Chirper is the in-game equivalent of Twitter and the city residents chirp about how things are going.) But there are also a few surprises buried in the Chirper feed. The majority of the messages are what you would expect telling you things like the garbage is piling up or no one has picked up a dead body (corpse removal is a big deal in Cities: Skylines). But there are also science fiction references mixed in like the chirp above or ones mentioning Veridian Dynamics or an Asimov flash mob.